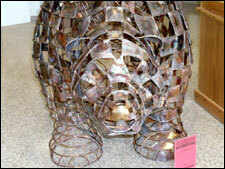 Standing guard at Boyertown High School’s 2005 Arts Expo is Bear Fever’s “Hal Bear-toia,” a bronze and copper bear fashioned by Val Bertoia and Dave Plum of the Bertoia Studio, Bally. “Hal” was sponsored by the TriCounty Chamber of Commerce and recently sold to National Penn Bank so that he can remain in Boyertown. “Bring it on,” invites “Bear Fever’s “Hal Bear-toia. 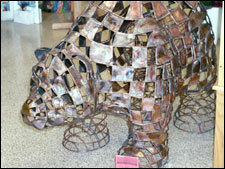 “Hal Beartoia,”features a checkerboard pattern of welded brass and copper sculpted in the walking Bear Fever form. Val, along with Dave Plum, sought to combine their assorted talents and to honor and commemorate Harry, Val’s father, the creator of the Bertoia Chair. Harry is known as a noted sculptor, architectural designer, graphics artist, jewelry maker, and innovative, highly-respected 20 th century artist. And so, inside “ Hal” is a chair in the Bertoia design, that Harry developed for Knoll Associates in 1952. Hal-Bear-toia, originally sponsored by TriCounty Area Chamber of Commerce, is now owned by National Penn Bank. First things first: Bear Fever offers a giant bear hug for Dale Mahle, president of the TriCounty Chamber of Commerce. Dale’s support for the Bear Fever project was immediate and profound. Not only did she secure funds to sponsor two bears, but the 2004 Boyertown Progress Dinner became the “kick off” event for Bear Fever. Two “raw” bear forms were the featured decorations at the event; Boyertown’s school colors—red and black—appeared everywhere: napkins, ice cream toppings, outfits. Excitement and enthusiasm for Bear Fever spread rapidly from Dale’s leadership and efforts. Dale knows success when she sees it and doesn’t “mess around” waiting to be asked. Decisive, results-oriented, and savvy are words to describe Dale and are reflected in today’s market value of the bear she requested belong to her beloved TriCounty Chamber. A chance encounter with Val Bertoia was one of Bear Fever’s luckiest moments. Aisha McNeill, one of my students in my Leadership 101 class, and I were visiting assorted businesses in Bally to try to inspire a Bally Shared Bear. As we walked the street, I noticed the Bertoia Studio sign. I knew of Bertoia’s work, but I really didn’t know the studio existed in Bally. So Aisha and I walked in, hollered a bit for attention; and when we were not able to rouse any human form, I called the studio’s phone number on my cell phone, heard the phone ring downstairs and someone answer. When it became known we were upstairs, we were soon joined by Melissa Strawser and Val Bertoia. Aisha and I explained the Bear Fever project, and Val was excited to be asked to join the project—not as a sponsor but an artist. We were ecstatic! And it wasn’t long before Melissa also expressed interest in doing a bear, volunteered her mother Barbara’s Strawser’s efforts, as well as Val’s sister Lesta. 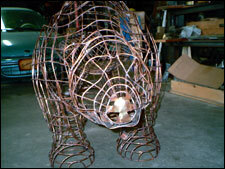 Bear Fever could now claim four Bertoia-related artists for Bear Fever! What luck! “Hal Beartoia,” features a checkerboard pattern of welded brass and copper sculpted in the walking Bear Fever form. Val, along with Dave Plum, sought to combine their assorted talents and to honor and commemorate Harry, Val’s father, the creator of the Bertoia Chair. 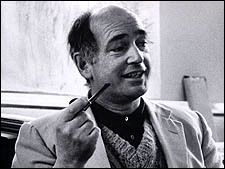 Harry is known as a noted sculptor, architectural designer, graphics artist, jewelry maker, and innovative, highly-respected 20 th century artist. 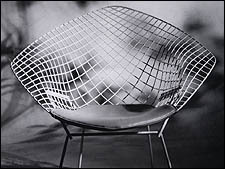 And so, inside “Hal” is a chair in the Bertoia design, that Harry developed for Knoll Associates in 1952. Bear Fever is proud and honored that this family of artists, their associates and family members have so generously…and happily…volunteered their efforts toward the TriCounty community. What gifts for us all to enjoy! And what generosity in spirit they exemplify! Information for this essay quoted from The World of Bertoia by Nancy N. Schiffer and Val O. Bertoia, Schiffer Publishing Ltd. Atglen, PA, 2003.